Then yesterday morning up at 5am to go back up there again. Rod and his Cubs made it into the District Cookoff, so we had to be up there for an 8.30 start....oh these early morning are a killer. The Cubs did so well, they didn't really compare to other the teams, they were alot older and you could definately tell that they had more experience.... but our Cubs had fun and that's all that matters. 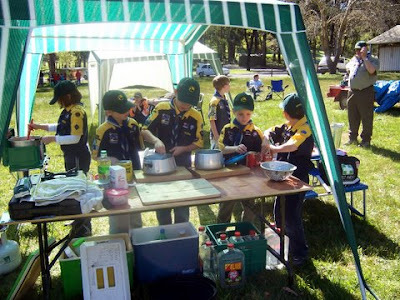 They learnt alot, but they did need a lot of help, they haven't quite got the skills yet to self manage themselves, still needing alot of direction from their Cub Leaders. 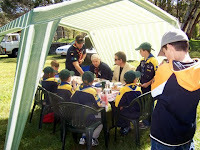 They had five teams compete and overall our Cubs came equal third, they were pretty impressed with that. Look at how tiny they are....so darn cute!!!! After the cookoff it was off to have fun with the other activities that were being held to celebrate Woodhouse's Birthday. 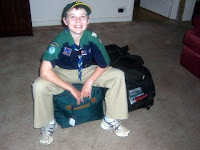 Aaron so far has had a hoot, this is first Scout Camp and he is having such a good time. 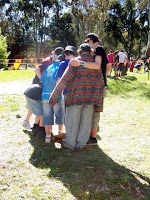 They did lots of stuff yesterday, lots of team building excercises. Aaron is in the blue "Get in the Game" T shirt and denim shorts. 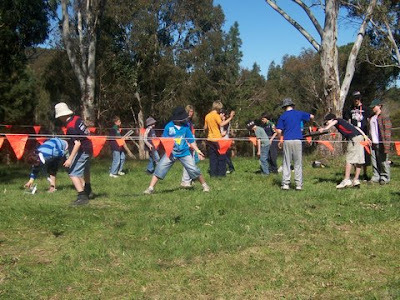 Once back at camp though the fun really started. 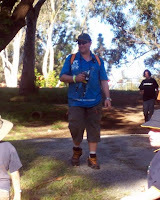 It just so happened to be their Scout Leader's, Griz's Birthday yesterday, so Renee had organised a Birthday Party for him. 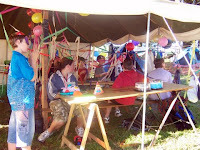 So the rush was on to get the balloons and streamers up and set up the Birthday Cake. He was as pleased as punch with the result when he came down over the hill. 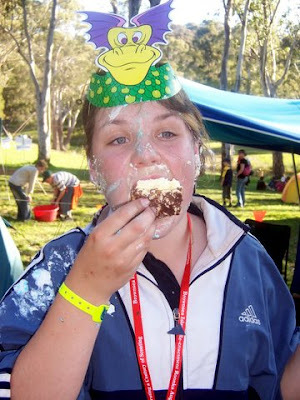 Birthday candles were blown out and the cake was cut.......and then one very mature Scout Leader decided to start a cake fight with Renee, they are great mates, and then it was on.....cake flying everywhere. 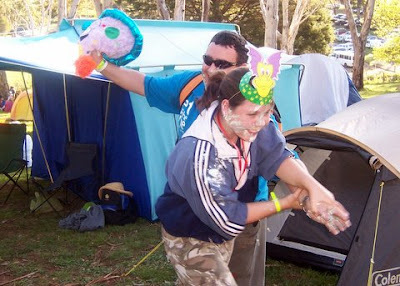 Thankfully it was only those two, otherwise there would have been alot of cleaning up to do. Got some great pics though. 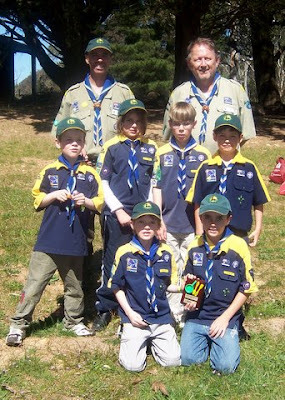 Anyway later today we are off to Woodhouse again to go and pick them up, gee the things you do for the love of Scouting LOL. In hindsight we probably should have taken up our tent and stayed up their last night it would have saved us a trip. However, in all the rush over the weekend, it wasn't planned very well on our part, oh well!!! Hi Leanne, what a hoot of a time looks like the kids had fun! especially our Nee love ya love Celina xxxxOrh by the way cheched out the breast cancer sight congratulations to everyone who clicked on the September goal we did it we reached our goal and 100 women will receive free mamograms how cool is that. I was up there for Campfire and the Leaders Reunion gathering after that. From what I saw Saturday night everyone was having a great time.